GOP governors cheer states, sneer at D.C.
A panel of GOP governors, moderated by Walter Isaacson, far left, on July 24, 2014. The panel included, from left, Gov. Sam Brownback of Kansas, Gov. Scott Walker of Wisconsin, Gov. Rick Scott of Florida, Gov. Nikki Haley of S. Carolina, and Gov. Chris Christie of New Jersey, far right. ASPEN – Taking their remarks Thursday evening at face value, you wouldn’t think that any of the five Republican governors on an Aspen Institute panel had any interest in ever working in the nation’s capital. “The hardest part of our job is Washington, D.C., because every time we move the ball, they push us back again,” said Gov. Nikki Haley of South Carolina, who took office in 2010 and is running for re-election. 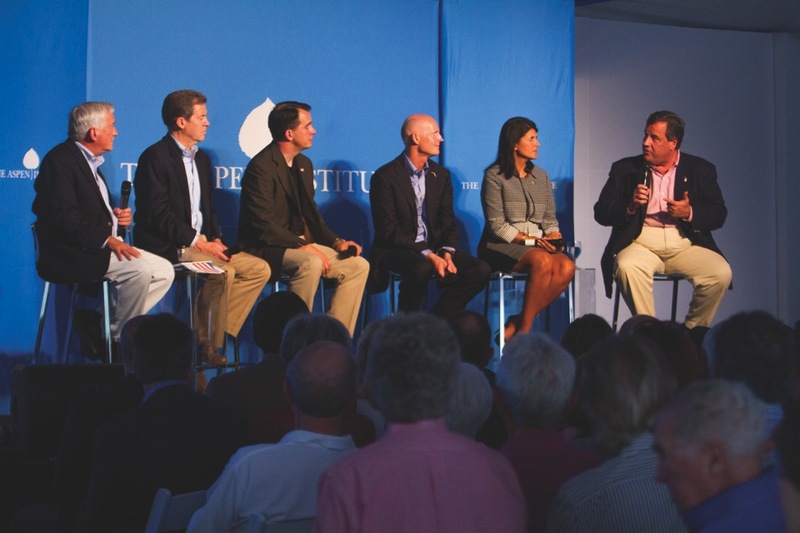 Haley was on an Aspen Institute panel along with Gov. Sam Brownback of Kansas, Gov. Chris Christie of New Jersey, Gov. Rick Scott of Florida and Gov. Scott Walker of Wisconsin. Christy is the current Republican Governor’s Association (RGA) chair and widely considered a potential presidential candidate in 2016. Walker, Brownback and Haley can also be found on a number of lists of potential Republican candidates. But there was no mention of the 2016 presidential race Thursday night from moderator Walter Isaacson, the audience or the governors. They were in Aspen for an RGA meeting, and likely, meetings with fundraisers. They spoke to an enthusiastic Greenwald Pavilion crowd as part of the McCloskey Speaker Series. A common theme among the five governors was that the best way for states to create jobs and stimulate economic growth was by cutting taxes on business, recruiting companies to re-locate, investing in employee training and getting people off of welfare and other government programs. “Tax cuts work,” Scott said. There was also consensus that Obamacare should be repealed, the border with Mexico should be secured, the power of teachers unions should be diminished, and steps should be taken to reduce prison populations. Christie was not specific about which drugs people are addicted to, nor did he mention marijuana. He said some people in New Jersey who are arrested for “holding and using,” but are nonviolent first-time drug offenders, are now being sent to one-year mandatory in-patient drug treatment programs instead of prison. On the subject of illegal immigration, Christie questioned why undocumented children coming across the border are being delivered to undocumented adults already in the U.S., and why those undocumented adults are being told by U.S. officials to make sure the children now in their care show up for a future immigration hearing. Haley also took a strong line on the immigration issue while taking a question from the audience. That drew enthusiastic applause from the audience. His review was also met with much applause. Editor’s note: Aspen Journalism collaborated on this story with the Aspen Daily News, which published it on July 25, 2014.